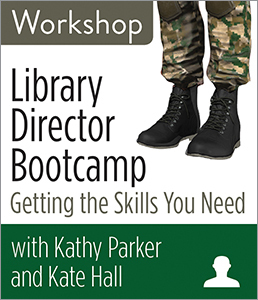 CHICAGO—ALA Publishing eLearning Solutions announces a new session of our popular workshop, Library Director Bootcamp: Getting the Skills You Need with Kathy Parker and Kate Hall. This workshop will consist of three 90-minute sessions and take place at 2:30pm Eastern/1:30 Central/12:30 Mountain/11:30am Pacific on Mondays, Nov. 5, 12, and 19, 2018. So you’ve finally made it—you’re a library director…now what? You can learn about management, but it’s hard to find a library school course that teaches you how to be a boss. This workshop is a primer on how to be a library director provided over three sessions that dive into key topics necessary to run a library. Covering library finances, trustee and director roles, relationships, personnel, legal issues, building upkeep, and the different types of insurance needed, these webinars will offer core competencies for every director. Learn how to stay organized and set yourself up for success in each area with practical tips and checklists woven throughout the sessions. Whether you have just become a director, want to be a director someday, or have been a director for a number of years, this workshop will answer the questions you might not have known to ask while increasing your understanding of the key topics needed to run a library. We’ll begin with understanding and preparing your financials, and then move on to trustee and director relationships. In the second session, we will dive into hiring, evaluating, retaining, and disciplining personnel and the legal ramifications that come with having staff. We will end the series with what you need to know about your building and insurance needs and review general legal practices and pitfalls to avoid. You will leave with a solid understanding of the core competencies you need to run a library in addition to checklists you can start using immediately to help ensure your success. Kathy Parker has over 35 years of library experience, with 15 serving as library director at Glenwood-Lynwood Public Library. Kathy has participated on various library boards and has served as a library trustee at her local library and in the regional library system, and started several continuing education initiatives for library staff and trustees. Kathy retired in summer 2018 and has started her own consulting business serving as an interim director, offering coaching to new directors, and helping boards hire directors. Kathy is the coauthor of a forthcoming book in Spring 2019 from ALA Editions on the essential skills you need to be a library director. Kate Hall has been a Library Director since 2010; first at New Lenox and now at Northbrook Public Library. Kate has held numerous library leadership positions and has worked with Kathy Parker on the successful Director’s University program that has taught over 100 new library directors what they need to know to run a library. Kate is active on many boards, including serving previously on the Illinois Library Association Executive Board and as President on the Reaching Across Illinois Library System. Kate is the coauthor of a forthcoming book in Spring 2019 from ALA Editions on the essential skills you need to be a library director.